Persistence Market Research (PMR) offers an eight year forecast on the global immune repertoire sequencing market. The primary objective of the report is to offer updates and information related to the opportunities in the immune repertoire sequencing market. In terms of revenue, the global immune repertoire sequencing market is expected to register a CAGR of 7.3% during the forecast period, 2018–2028. The primary objective of the report is to offer insights on the market dynamics that can influence the growth of the global immune repertoire sequencing market over the forecast period. Insights on the key trends, drivers, restraints, value forecasts and opportunities for the companies operating in the global immune repertoire sequencing market are presented in the report. The global market for immune repertoire sequencing is expected to witness high growth in terms of value in Asian countries due to substantial price drop in sequencing platforms and integration of new technologies in biomedical research including advancement in genome sequencing. In addition, increasing international collaboration in immune repertoire sequencing projects by other developing nations is also expected to drive the growth of the immune repertoire sequencing market. The report includes immune repertoire sequencing component types such as assay kits, software (including software integrated system platforms) and services. However, the report does not include revenue generated by the instruments or devices (running without integrated software) and accessories incurred in various academic institutions and research centres. Revenues of third-party service vendors or representatives of primary service providers are excluded in the report. Besides, the currency fluctuations and inflation are not considered while calculating the revenue of the global immune repertoire sequencing market. To understand and assess the opportunities in this market, the report offers the market forecast on the basis of segment type classified into the component type, application, end users and regions. The report provides analysis of the global immune repertoire sequencing market in terms of market value (US$ Mn). The report begins with the definition of immune repertoire sequencing, followed by definitions of different product types. The market dynamics section includes PMR’s analysis on the key trends, drivers, restraints, opportunities, macro-economic factors and key market strategies influencing the growth of the global immune repertoire sequencing market. In addition, we have considered the Year-on-Year (Y-o-Y) growth to understand the predictability of the market and identify growth opportunities for companies operating in the global immune repertoire sequencing market. Another key feature of this report is the analysis of the key segments in immune repertoire sequencing market in terms of absolute dollar opportunity. This is usually overlooked while forecasting the market. However, absolute dollar opportunity is critical for assessing the level of opportunity that a provider can look to achieve, as well as to identify potential resources from a sales and delivery perspective for services offered in the global immune repertoire sequencing market. To understand the key segments in terms of their growth and performance in the global immune repertoire sequencing market, PMR has developed a market attractiveness index. The resulting index will help identify the existing opportunities in the global immune repertoire sequencing market. In the final section of the report, the ‘competitive landscape’ has been included to provide a dashboard view of the key companies operating in the global immune repertoire sequencing market. This section is primarily designed to provide clients with an objective and detailed comparative assessment of the key provider’s specific to a market segment in the global immune repertoire sequencing market. However, this section also includes market strategies and SWOT analysis of the key players operating in the global immune repertoire sequencing market. Detailed profiles of the assay kit manufacturers, software and service providers of immune repertoire sequencing are also included in the scope of the report to evaluate their long- and short-term strategies. Examples of some of the key players operating in the global immune repertoire sequencing market are Illumina, Takara Bio Inc, BGI, Thermo Fischer Scientific, and F. Hoffmann-La Roche Ltd, among others. The human adaptive immune system protection is mediated by receptors on the surface of B and T cells known as B-cell receptor (BCR) and T-cell receptor (TCR), respectively. Developments in next generation sequencing (NGS) have enabled the development of a powerful new technology known as immune repertoire sequencing for probing the complimentary determining region of these receptors. Immune repertoire sequencing has helped in profiling the antigen-specific information within lymphocytes and has become increasingly significant to understand the body’s auto-defence mechanism against foreign agents. Immune repertoire sequencing profile is an accurate and sensitive platform technology with less fitfall. It is less invasive and requires very little sample, to provide a dynamic picture of the region of interest. In the coming years, method development in the immune repertoire sequencing will gain prominence, only if they succeed in generating in-depth sample information compared to the current techniques. Single-cell approaches are likely to dominate in the future in immune repertoire sequencing for their ability to provide high-dimensional and in-depth information on smaller populations of interest including antigen-binding cells. 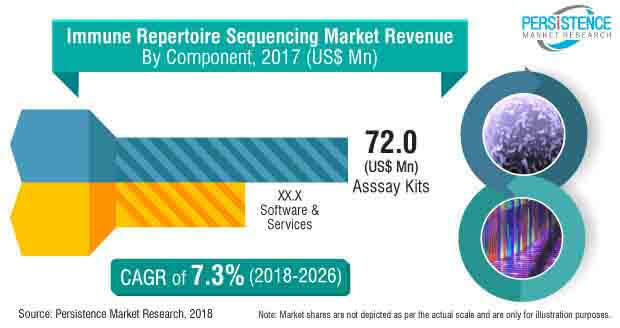 In terms of revenue, the global immune repertoire sequencing market is projected to grow at a CAGR of 7.3% during the forecast period and is expected to be valued at US$ 173.0 Mn by the end of 2026. In terms of value, North America is expected to be the dominant regional market for immune repertoire sequencing by 2018 end and is expected to expand at a CAGR of 6.3% over the forecast period. Asia Pacific is expected to be the fast-growing regional market for immune repertoire sequencing in terms of revenue registering a CAGR of 9.9% over the forecast period. In North America, the U.S. is expected to be the dominant market for immune repertoire sequencing due to increasing demand for immunotherapy for cancer and other infectious diseases. According to the U.S National Cancer Institute, in 2018, an estimated 1,735,350 new cases of cancer are expected to be diagnosed in the U.S. The best indicator of progress against cancer is development of immune therapy and vaccine development to target specific cancer cells, where immune repertoire sequencing methods will play a pivotal role. The second dominant regional market for immune repertoire sequencing is Europe due to an increase in healthcare expenditure and funding by the government. It has led to increase research in genomic, autoimmune disease and oncology, where Immune Repertoire Sequencing products applications are high. In addition, there are several manufactures present in the region, which address to an increasingly competitive immune repertoire sequencing market. The highly competitive scenario in Europe coupled with high capital funding in biomedical research has led to price drop in genome sequencing, thus driving the growth of the market for immune repertoire sequencing. The Asia-Pacific, majorly China & Japan markets for immune repertoire sequencing are expected to witness significant growth in the global immune repertoire sequencing market over the forecast period. The adoption of immune repertoire sequencing technique has also increased in Asia Pacific, which is expected to drive the growth of the market for immune repertoire sequencing in the region. Increase in international collaborations for immune repertoire sequencing and developments by China and Japan for integration of new technologies are expected to drive the growth of the market for immune repertoire sequencing over the forecast period. In Latin America, new and advanced product introductions by market players including those in immune repertoire sequencing and increase in incidence of infectious diseases will fuel the market growth in the region. However, the Middle East & Africa is expected to be the least attractive market for immune repertoire sequencing due to lack of skilled personnel and internet access limitations for data analysis. However, substantial decline in pricing of immune repertoire sequencing and fostering international collaboration for genomic research might help the region’s immune repertoire sequencing market to grow in the future. To conclude, high throughput sequencing of both immunoglobulin and TCR sequences creates numerous opportunities for the immune repertoire sequencing market to expand the domain knowledge of human biology and medicine. A realistic approach such as immune repertoire sequencing for analysis of TCR CDR3 or complement diversity is crucial to understand the molecular mechanisms of adaptive immunity for both health and medicine. Apparently, the immune repertoire sequencing knowledge could also be shared in biomarker discovery, vaccine development, and transplant selectivity. Though, as much as this immune repertoire sequencing technology presents an opportunity, it brings with it major challenges. For data storage and data analysis, new sequenced databases, computational algorithms and advanced software for whole immune repertoires analysis are the need for the hour. Most importantly, potential errors generated during the immune repertoire sequencing process may skew the data interpretation. Apparently, the enormous sequencing reads generated by NGS technologies markets offer cautious interpretation. With continuous developments in immune repertoire sequencing, the market is expected to grow in forecast period thanks to numerous scientific discoveries in TCR and BCR repertoire. Such immune repertoire sequencing developments will form the basis for new clinical implications in development of personalized medicine and will provide deeper understanding of behaviour and response of adaptive immunity.